We've said it time and time again here at homify; great things often come in small packages. Today's feature home is no exception, and opts for the 'less is more' aesthetic with grace and refinement. As we see compact homes increasing in popularity, it's important to remember that size doesn't necessarily mean compromising on modern necessities or amenities. Quite the opposite in fact—this dwelling boasts everything one might need for cosy and comfy 21st-century living, while offering it all up in a neat, tidy and sophisticated package. Conceived, planned and undertaken by Toki Architect Design Office, this property boasts strong design lines and interesting angular forms. A contemporary take on more traditional architecture, the structure balances heritage features such as the pitched roof with other more modern aesthetics like the colour scheme. Unique and inviting, we'd love to take you on a tour of this interesting property. 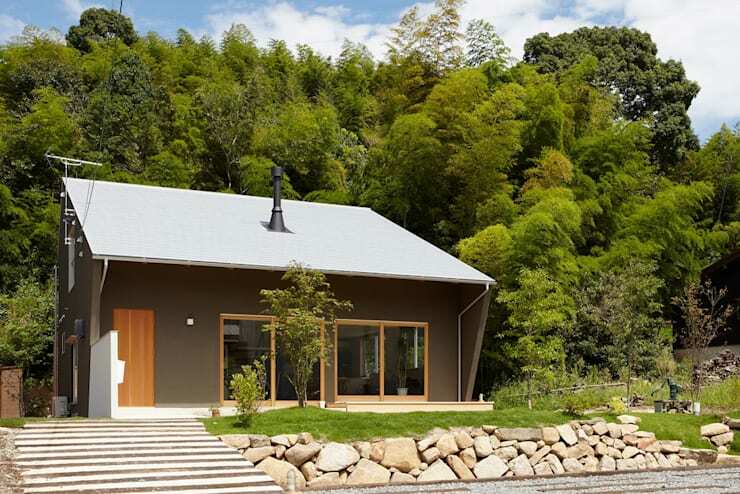 Read on below and check out this intriguing and inspiring abode! Nestled within a patch of greenery, this home looks wonderfully compact, yet extremely inviting. The geometry of the dwelling is very noticeable, while unique and innovative features give depth and uniqueness. Adding to the contemporary ambience of the abode, the dark, earthy colour scheme is warm and perfectly matches the timber finishes and stone retaining wall. One modern feature of the home that is definitely noticeable is the abundant use of glazing. Huge windows overlook the street, and during warmer months can be opened up to fill the interior with a warm and inviting breeze. 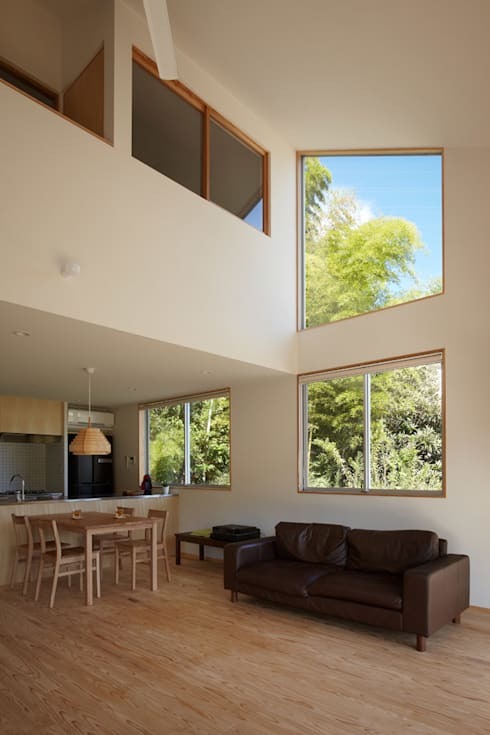 As we enter the home's interior we see how the ample glazing brings in a large volume of natural light, and fills the dwelling with an inviting sense of comfort. 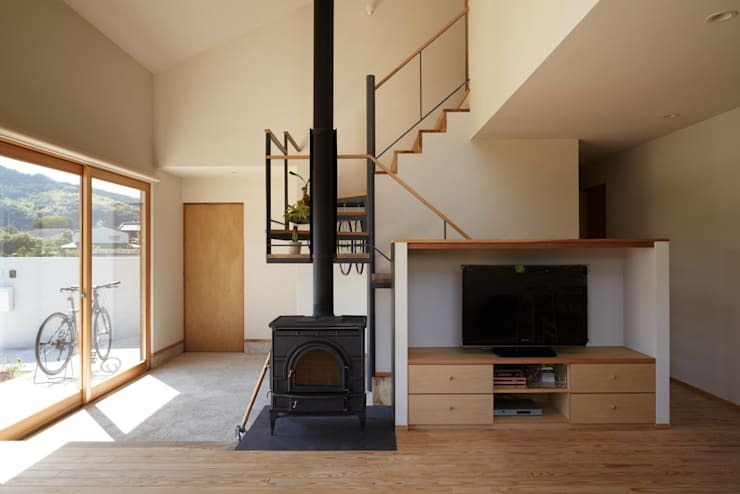 The room is a double-height space thanks to the shape of the ceiling, and feels rather expansive, which is a departure from the compact aesthetic we saw when viewing the home from the street. Natural finishes have been employed throughout, with timber utilised and incorporated to add warmth and a hospitable atmosphere. 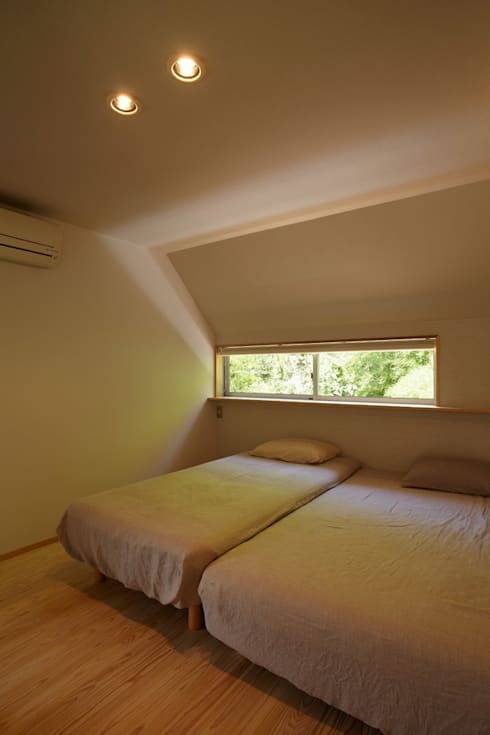 The combination of high ceilings, white colour palette and organic materials help the room feel spacious and luminous. The large statement window adds a particular essence of impressiveness within the interior area, and helps frame the furniture, while illuminating the other social spaces. As we saw in the large living space, as well as the exterior of the home, timber is a material that helps create a desirable essence and ambience. The kitchen is characterful and charming, with bright timber joinery adding elegance and timelessness. In addition, small white tiles add a modern touch, and ensure the space feels practical as well as stylish. The kitchen island offers delineation between the dining and the cooking spaces. It is here the designers have opted for a small yet social dining area that once again boasts timber furniture. To add a funky and individual touch, a ceiling light has been added to create originality and charisma in the room. 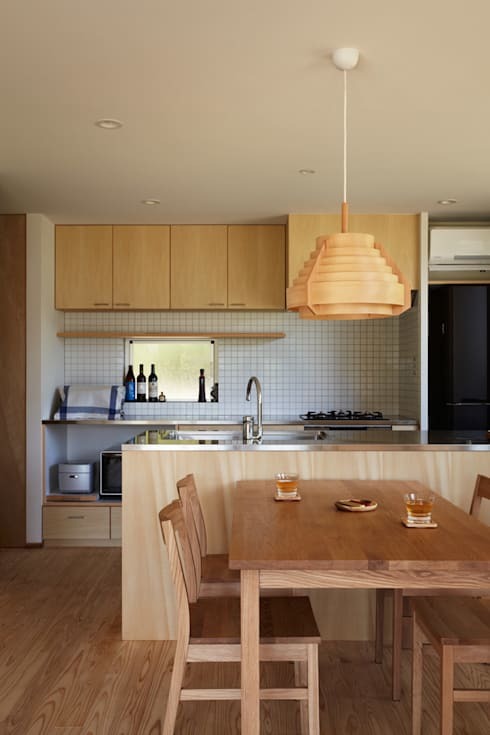 Although compact, the dwelling has been planned and conceived to include all necessary accoutrements, fittings and fixtures. In this image we have switched our perspective to take a look at the other side of the large and open room. From this angle we see the staircase that leads upstairs, as well as the fireplace and the media/entertainment cupboard. Both clever and cosy, the fireplace is definitely the standout feature that implements a sense of homeliness. Ideal for gathering the family together on a chilly winter's eve, this living room manages to traverse the line between welcoming and warm, as well as minimal and modern. Upstairs we head inside the bedroom. Here the minimalist style is definitely visible, while the designers and architects have opted for a layout that ensures the room is cosy and warm. Almost cave-like in its setup and shape, the white walls, timber floor and simple beds make for a fuss free and uncomplicated aesthetic. The small horizontal windows add a wonderful moving artwork to the room, while filling it with abundant natural light throughout the day. However, in keeping the windows long and linear, they have managed to ensure privacy from peering eyes, as well as limit the potential for bright sunlight to unnecessarily heat the room. For one final peek at this dwelling before we end our tour we head back outside. Taken at dusk, the house presents its strong geometric lines and forms, while the windows offer up an amber glow that is simultaneously beautiful and alluring. What did you think of this home? If you'd like to check out another stylish abode, and take another tour, we recommend your take a peek at: The traditional home with a sparkling surprise and continue reading. 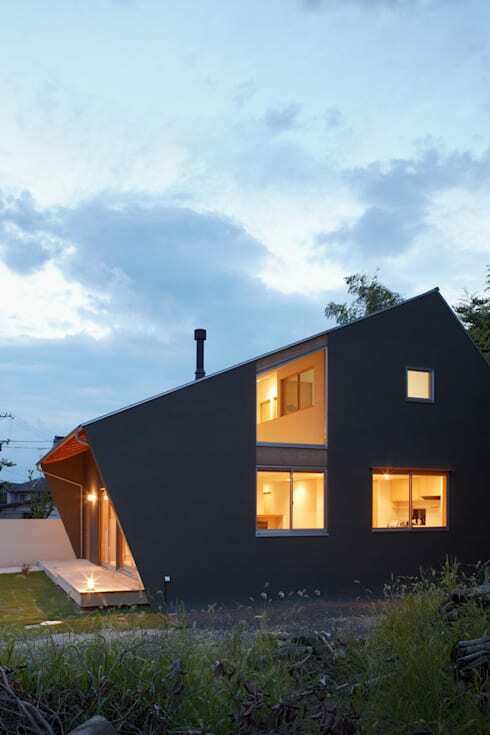 What do you think of this angular yet cosy family dwelling? Let us know below!